Your car's battery is vital to your vehicle. Without a strong battery, you may get stranded because your vehicle won't start. The best way to keep your battery strong is to schedule regular battery services and inspections at BMW of Nashville. If you notice that your vehicle's battery case is bloated or your battery is temperamental, you should schedule an appointment for a professional battery service. A professional automotive technician can determine the correct battery size for your vehicle that will result in optimal performance. 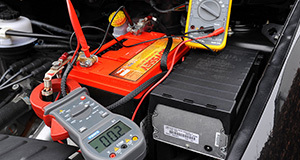 A professional can conduct tests to determine if your battery needs to be cleaned or replaced. If you get your battery replaced at BMW of Nashville, we offer a warranty that can replace your battery within a certain period of time if it's defective. To schedule an appointment for a battery or repair service, contact BMW of Nashville or use our online appointment portal. At BMW of Nashville, we employ automotive technicians who are certified and meet BMW industry standards. BMW vehicles have unique requirements. Our automotive technicians understand how to maintain and repair these vehicles. Our dealership sells pre-owned vehicles that can be maintained and repaired by our technicians. Regardless of the make or model, our team of automotive technicians can repair various types of cars. When you purchase a BMW or any other type of car, you want it to last as long as possible. One way to maximize the life of your vehicle is by using original equipment manufacturer (OEM) parts. Unlike aftermarket parts, OEM parts work according to the specifications of the vehicle manufacturers. Another reason our dealership uses and sells OEM parts is they are guaranteed by a warranty. Many companies that make aftermarket parts only offer a limited, short-term warranty if they offer one at all. Our vehicle parts at BMW of Nashville are just as good as the parts that were in your vehicle when you purchased it.